We have been in Pretoria today staying with Judy and Ian Goldman. Ian is a member of the ColaLife Virtual Advisory Board. The focus has been on catching up with emails and amongst these was this great report from ColaLife supporter Stewart Martin who is just back from a trip to Kenya and Uganda. I’m now back from Kenya and Uganda, and have placed a few photos and a couple of short videos on Flickr using the ColaLife tag. Coca-Cola was certainly a prominent product throughout Uganda as we travelled west from Kampala over to Queen Elizabeth National Park, to Bwindi, Lake Bunyonyi and onto Jinja. In those travels we passed a couple of major distribution points, plenty of rural outlets and opportunist crate sales as well as a number of Coca-Cola branded houses! In Kenya in a remote community, not far from the border with Uganda (Malaba border crossing), we got involved in a project to improve a spring which serves over 600 families with water. 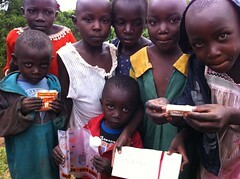 While there I took a few photos of local children with the AidPods. In speaking to the village elder and through him a few others, the consensus seemed to be that they felt ColaLife was an excellent idea, and they allayed our concerns that the products might be taken out and sold/redirected. The people we spoke to felt confident that once the AidPods got to the rural communities there would be no problem with theft or redirection. 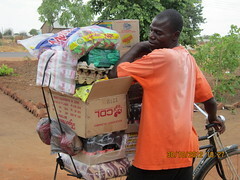 The contents were familiar to the people we met, with the exception of the SODIS bag. People were travelling from miles around to get to the spring, which provided very poor water, and yet just half a mile down the road a couple of houses had Coca-Cola stocked (a scenario I’m sure you are very familiar with and giving rise to the ColaLife idea)! Friends I met up with suggested that Pepsi are understood to be mounting a challenge to gain market share in East Africa, something we saw little evidence of (two lorries in the space of two weeks) but thought I’d add. 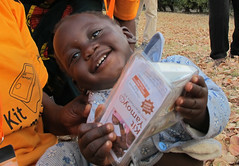 I’ve left the AidPod and t-shirt with friends in Kenya, who will endeavour to take more (better!) photos over the coming weeks and months, and also use the flat-pack AidPods with children. My friend in Uganda who works for DFID was concerned that the government is afraid of losing control (generally) and therefore would be reluctant to see health provision through alternative routes. My friend in Kenya who is effectively running a hospital and medical outreach programmes was far more positive, thinking the idea to be brilliant, and keen to be involved in any further work. I could ramble on further, but hope that the photos prove helpful and if you need anything more please let me know. The developments in South Africa look great. Finally, have you considered adding ColaLife to Everyclick*? It allows supporters to make ColaLife their everyclick charity, using everyclick for website searches and generating income over time for the charity. 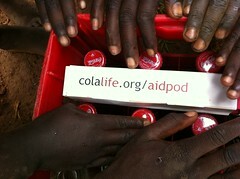 Only small amounts are raised but given the interest in ColaLife it could add up to a significant amount over time. * We will be looking at the Everyclick opportunity once ColaLife is a registered charity – registration has been applied for, as reported here.